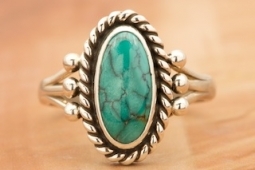 Genuine Turquoise Mountain Mine Stone set in Sterling Silver Ring. Created by Navajo Artist Angela Martin. Signed by the artist. The Turquoise Mountain Mine is located in the Mineral Park Mining District, Mohave County, Arizona. Although Turquoise Mountain is located near the Kingman Turquoise Mine it is considered a classic mine in its own right because the Turquoise is so different in appearance. It is also known as "Old Man Turquoise".